Secure front entrance of The Dorothy. 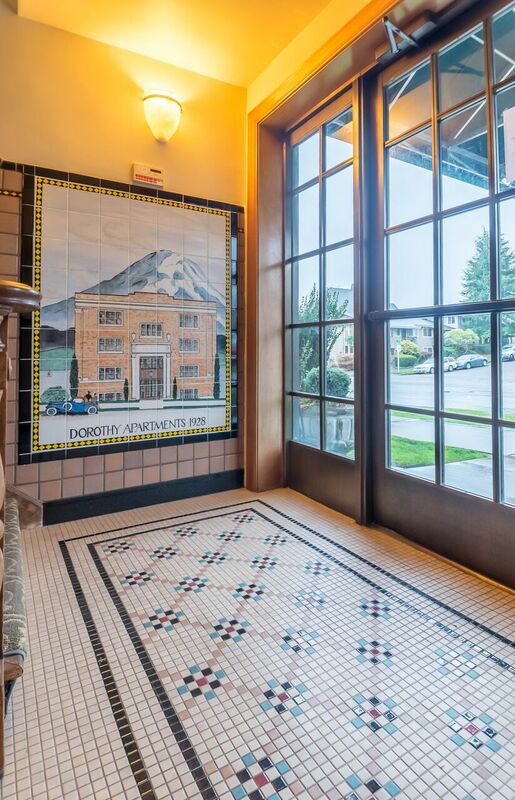 Efficiency, history, warmth, and location all meet in this studio condo in Tacoma's beloved Stadium District. Found on the 1st floor of the The Dorothy (honored to be on the Tacoma Register of Historic Places), this tiny home provides ease surprising for its size. From the complete kitchen, to the full bath, numerous closets, and stacked washer/dryer, this well-appointed studio has it all. Finished with oak floors, honeycomb tile, coved ceilings, and original unpainted woodwork, the rooms are classically stylish. Upon entering The Dorothy, you're greeted by a mural and mosaic tile floor. Take just a few steps down to the first floor and find home behind door #106. Inside, stained wood closet doors, hardwoods, and the kitchen with stainless appliances and white cabinets welcome you in. Glass front cabinets hang above the sink for display of favorite dishes, and the dining area is just beyond, set beside a large double window. Turn right from the entrance for the living space. Lit by another set of double windows wrapped in beautifully stained wood trim, this room is your bedroom, living area, lounge, parlor, and office all-in-one. Get creative and see how nicely this room accommodates both your sleeping and living space. The full bath features a pedestal sink, white honeycomb tile floor and white tile to the ceiling in the bathtub/shower combination. There's even a linen closet in here! Did I mention the closets? This little studio is pretty well set with storage options. HOA dues come in under $300 and include garbage, lawn service, water/sewer, cable TV, and common area maintenance. And the location is truly one of the best parts of this place. Between Downtown and the North End, The Dorothy is part of Stadium, one of Tacoma's most walkable neighborhoods! Thinking of going out? This condo is just one block away from the Indo Street Eatery, Shake Shake, Shake, and the Art House Cafe. One more block and there's breakfast at The Harvester, or a pint at The Copper Door. Head up 1st Ave and find locally owned and operated Stadium Thriftway as well as The Rhein Haus for beer, brats, bocce ball, and platters of schnitzel. There's coffee at Tully's just 2 blocks from home, or walk a bit further in the fresh air (.3 miles to be precise) for a fresh brew at Cosmonaut Coffee across from Wright Park. Yes, Wright Park is that close by. If you don't already know it, you want to. It's a 27 acre park filled with hundreds of trees, a spray park, a conservatory, lawn bowling, blossoms, a pond with a fountain, swimming birds and singing birds, and stately statues at either end. Tacoma loves Wright Park! Come take a look and see if you'd like to call this condo (and Stadium, and Wright Park!) home. Walk through from a small foyer into this well-appointed kitchen complete with stainless appliances. The living space allows for stuffed chairs, a couch, side tables and room to move. Studio living combines sleeping and lounging areas into one. Looking through from the bathroom across the living space into the dining area. Dining area attached to the kitchen is well lit and cozy. Full bath includes window, pedestal sink, bath/shower, and tile floor. Stow sheets and towels in this handy linen closet. Dresser and shelving fit nicely into a closet space to keep the main living area tidy. Studio is complete with its own laundry room tucked behind a door. The front, southwest facing side of The Dorothy.